Coming together against any move by the Centre to suspend the Narmada Control Authority decision to raise the height of the Sardar Sarovar dam, BJP and Congress MPs from Gujarat today met Prime Minister Manmohan Singh saying the project was the “lifeline” of the state. Is the increase in the number of liquor shops warranted? In a major decision, the Supreme Court has set aside a judgement of the Punjab and Haryana High Court by which it had refused to interfere in the findings of an inquiry officer and various appellate authorities. The much-acclaimed Shatabdi Express, introduced by the Indian Railways with an objective of providing luxury yet affordable rail travel in the region, no longer inspires the confidence it had generated about a decade ago. 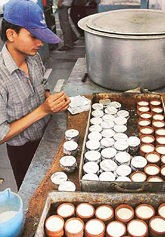 Curd being packed for Shatabdi at Ambala Cantt railway station. Wireless system of the Amritsar police was partially paralysed today when lightning struck malkhana of the Court Complex, near Deputy Commissioner and SSP office, here. Ten security personnel were killed and two seriously injured in a Naxalite attack on a police camp in Dantewada district's Murkinar village, the police said today. Should admissions to specialised courses be on the basis of caste or merit? Students of the Indian Institute of Technology, Madras, are planning to boycott classes to mark their protest against the proposal to increase reservation in IITs and IIMs. These are schools that were established during the British regime, when the country was striving for Independence. And years after the country won its freedom, some of these schools, that stood for certain values and ideologies are struggling to exist. A man hailing from the birth place of Guru Nank yesterday became the first Sikh in Pakistan to be commissioned into the army. Wearing a blue turban and sporting a traditional beard, Hercharan Singh of Nanakana Sahib, marched to the military tunes at the Pakistan Military Academy in Kakul and was formally commissioned into the army at a ceremony presided over by Prime Minister Shaukat Aziz.